A small game made for the 2017 Global game jam at the Glasgow site. 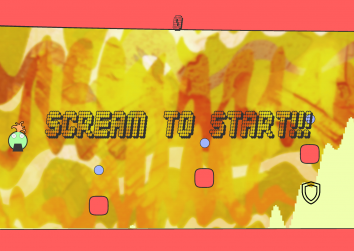 In this game you take control of a small green blob and need to scream to make him go up or down to avoid obstacles and get to the end! The game uses volume and not pitch of the voice. Make sure you adjust your microphone settings to best suit your experience and if possible use a microphone far from the pc as the game sounds might interfere with your voice. The game can be multiplayer with as many people as you want, scream all together or in turns to save breath! Have fun and happy screams! Just unpack and play, 16:9 resolution is advised.